Parking.com offers convenient parking for The Comedy Store. Discount parking is available at The Sunset for $8 with validation. This indoor parking garage is located off of Sunset Blvd, just a short walk from The Comedy Store. The Sunset can be accessed from Sunset Blvd on Alta Loma Rd. Upon arrival, you must obtain a ticket then proceed to park in any unreserved parking space. Take the elevators to exit at street level and The Comedy Store is located a few blocks east of the parking garage. You must obtain a parking validation from Will Call at The Comedy Store. If you forget to do so, parking staff will be onsite at The Sunset through 12:30 AM to obtain a validation. The parking office is located at the entrance of the garage and proper proof of attendance to a show is required to receive validation. To receive the $8 rate, you will need to pay for parking at a pay station located inside the garage or upon exit at the gate. Simply insert your parking ticket into the machine and once the regular $15 rate appears, insert your validation ticket. The rate will automatically change to $8 and you may process your payment. After paying the amount, take your validated ticket and proceed to exit the garage by submitting your validated ticket at the exit gate. The Comedy Store is a long-running comedy club featuring famous and emerging talent. 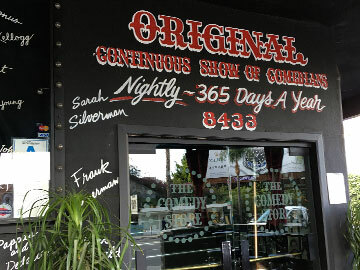 Artists who have performed at The Comedy Store include Johnny Carson, Jim Carrey, Robin Williams, Richard Pryor, Chelsea Handler, and Roseanne Barr.